Roger Goodell's Sanctimonious Pledge To "Make Everything Safer, Including Our Military"
The New York Giants—I'm sorry, "the New York Football Giants," per the New Jersey stadium announcer, a construction that's supposed to remind listeners of the black-and-white days when the city had two pro sports teams with the same name but which now comes off as a bridge-and-tunnel "frozen tundra"—entered the field for Wednesday night's NFL opener against the Dallas Cowboys through a tunnel of smoke. If you were looking for an apt metaphor for the start of the 2012 season, this was it. The Giants should have had the crowd hold up tiny mirrors, too. Pay no attention to the scab refs who are about to destroy the game! And if they don't, let's all forget the scorched-earth negotiating tactics league management has undertaken in consecutive seasons against its players and officials, the people on the field during the run of play. How about that new study, reported Wednesday, of 1994 government data revealing that NFL players are three to four times more likely to die of brain-related disease than the rest of the population? Please see the press release, released earlier Wednesday, announcing the league's $30 million donation to the Foundation for the National Institutes of Health to support research on "serious medical conditions prominent in athletes and relevant to the general population." 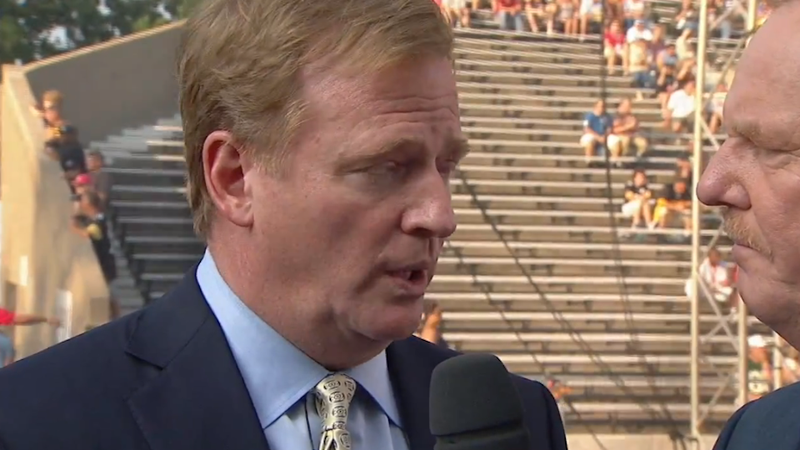 These are complicated times for Roger Goodell. How do you respond, publicly or privately, to the latest suicide of a retired player? What do you say about the wave of litigation that, since the Giants won Super Bowl XLVI in February, has surged past 3,400 plaintiffs in more than 130 lawsuits? How do you personally process the latest story about the ex-player in his late 30s who needs to use a tape recorder to remember the details of conversations? How do you answer calls to end football, especially for kids, or craft a comeback to thoughtful essays by writers who claim they're done with the sport? For starters, you get your talking points down cold, which isn't hard for a senator's son. In a 16-question interview posted Wednesday on NFL.com, Goodell used the words safe, safer, and safety 15 times, ignoring the chorus that thinks "safer football" is oxymoronic. You also link football to other sports, and other walks of life, especially another steely, beloved, dangerous American institution, the military. The NFL, Goodell said in the interview, wants to "improve the safety of our players and well beyond our players—in other sports and even beyond sports." It is funding research that "we will share with everybody so that we can make everything safer, including our military." Make everything safer! Who doesn't want that? NFL.com: Do you think football is responsible for those types of things? Goodell: Those are things that the scientists, again, they'll have to make those decisions at some point in time. But I think there's a lot of science that still needs to be done, because one thing we've determined and been able to work with medical professionals on, there's a lot of unknowns when it comes to brain injuries. There are a lot of knowns, too. Fans, Drew Magary argued on Deadspin, won't abandon football because they don't personally know or much care about the entertainers on the field. The moral dilemma is a pose: " 'I stopped watching football' will soon be the new 'Oh, we don't own a television,' " Drew wrote. But for the 120 hours a week when NFL games aren't being played, fans will be exposed to stories about injuries and deaths to current and former players, and it'll at least force some of them to think differently about the game. That might be just a media narrative for the 2012 season, but it's also true. For me, this week's oh-brother moment occurred when it was reported that Cowboys tight end Jason Witten offered to sign a medical waiver to play against the Giants just 23 days after his spleen was lacerated in a preseason game. In the end, doctors "cleared" Witten, and he caught a couple of passes in the 24-17 Dallas win. Afterward, linebacker Sean Lee called him "the ultimate warrior." Quarterback Tony Romo said he was "the best teammate." The Cowboys' owner, Jerry Jones, called him "inspirational." Witten's spleen was unavailable for comment. No such hosannas were bestowed on The Replacements, whose existence on the shimmering turf (that fake grass in Met Life Stadium looks awful) the footballing media (including this here roundtable) had pre-declared a scourge on the sport. The mockery continued on NBC, with Al Michaels and Cris Collinsworth repeatedly referring to referee Jim Core as an eighth-grade geography teacher from Boise, Idaho. Funny, but I don't recall it being mentioned during previous NFL telecasts that locked-out ref Ed Hochuli is a lawyer in Arizona, or that locked-out crew chief Alberto Riveron sells storm panels in South Florida, or that locked-out officials Gene and Tony Steratore co-own Steratore Sanitary Supplies in Washington, Pa., or that locked-out sideline judge Jimmy DeBell is—NOOOO!—a high-school gym teacher in Dansville, N.Y.
To untrained eyes, namely those of the millions watching on TV, the replacements did fine; even Collinsworth said so near the end of the game. The Giants weren't as charitable. "I haven't been held this much since I was a baby," linebacker Mathias Kiwanuka complained, excellently, after the game. The Cowboys were, unsurprisingly, satisfied. With a sample size of one game, with an A-Team of replacements, with no punters or any other players injured by a blown call, the score is Goodell 1, Union 0. Fifteen more opportunities for the replacements to screw things up this weekend and push the NFL toward concessions, or maybe push the players union to take a real stand against potentially substandard working conditions on the field. But if the teams are as bad as the Giants and Cowboys were in the first two quarters, it'll be hard to complain about the zebras. At halftime, I switched to Bill Clinton, who moved the ball more effectively than Eli Manning and used his hands much better than Victor Cruz. If this wasn't enough NFL news, former team owner Art Modell died Thursday morning at age 87. In the 1960s, Modell cajoled his fellow owners to negotiate league-wide TV deals. He supported expansion and the 1970 merger with the AFL. He backed the broad revenue sharing that has given NFL teams in small cities a chance. He donated millions to charity. He gave African-Americans, notably ex-player Ozzie Newsome, important front-office jobs. Oh, and he moved the Cleveland Browns to Baltimore. I believe some people have strong feelings about that. Stefan Fatsis is a panelist on Slate's sports podcast Hang Up and Listen. His latest book is A Few Seconds of Panic: A Sportswriter Plays in the NFL.